KYU-KYU is a national Azerbaijani vegetarian dish, made of fresh chopped herbs and eggs, and served with a sauce of yogurt and garlic. Wash the herbs and chop them finely. Put them in a large bowl. Add the flour, the eggs, salt and pepper, and mix well. Melt butter in a deep frying pan. 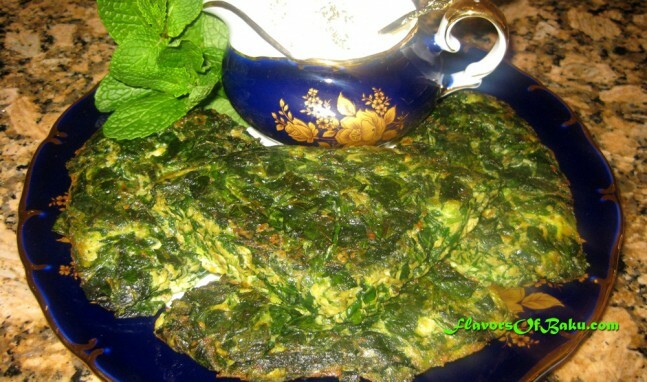 Pour the egg-herbs mixture into a pan. Place some small pieces of butter on the top, cover your pan with a lid, and fry over low heat until eggs are cooked. Cut KyuKyu in quarters and turn them over. Cook for another five minutes, then turn off the heat and leave KyuKyu for a minute in a pan to absorb all the butter. Serve hot with yogurt-garlic sauce. It is necessary to fully dry the herbs before the cooking them. That way the kyukyu will be much taller and fluffy. Yes, you are right, you need to pat dry the herbs with towels (or paper towels), to remove all water before cooking.